It's that time of year when grower's think about pruning their avocado trees. What scars many growers is the regrowth that occurs. If the cut is to the middle of a branch, there is all kinds of wild growth that results. The best cuts are back to a crotch or a subtending branch. Then there is little regrowth. Sometimes those cuts cannot be made and a mid-branch cut needs to be made. Tre-Hold, naphthalene acetic acid was registered on avocado several years ago to retard that regrowth. The growth hormone is mixed with white latex paint so it is possible to see where it has been applied. We recommended that the paint be hand applied to a distance two times the width of the cut. So if the cut is 2 inches in diameter, paint back 4 inches around the base of the cut. It works. Many growers don't use the material, but recently I saw a neatly pruned grove that has been using NAA for a number of years and in order to avoid any confusion about how much paint to put on, they just apply a 2 inch width of paint to all the cuts. This is easier for the pruners and speeds up the process. Try it, you may like it. It certainly saves time in maintenance over the long haul after pruning. In the past avocados were rarely pruned. In fact, if the trees got very big, growers would stump them down to 3-4 feet and then let them regrow. This would often be a disaster, since the trees rapidly grew to stupendous sizes again. They also might regrow then suddenly collapse, because all that regrowth was coming at the expense of energy being sent to the roots. If the roots were compromised by root rot, they would then not have the energy to fend off the disease. So by bringing the canopy into balance with a sick root system that was continuing to die and was not being fed by a big canopy, the root death would accelerate and when the canopy and root system became imbalanced again, the whole canopy would collapse and the tree would die. Also, this wild regrowth was wild and hard to manage. The adage of “prune avocado trees cautiously” was heard round the avocado community and as a result many growers would not do anything. The trees growing larger and larger and larger with the fruiting canopy going higher and higher and higher and picking costs and liability going up. Tree thinning was practiced, where every other tree would be removed so that light could penetrate into the orchard, encouraging more fruit production and slowing tree growth. But they would still grow and another thinning would be needed. The original commercial ‘Hass’ orchard in Carpinteria started out in 1954 with 140 trees and 40 years later was down to 17 trees and was still productive, but they were monsters that were finally felled by root rot. 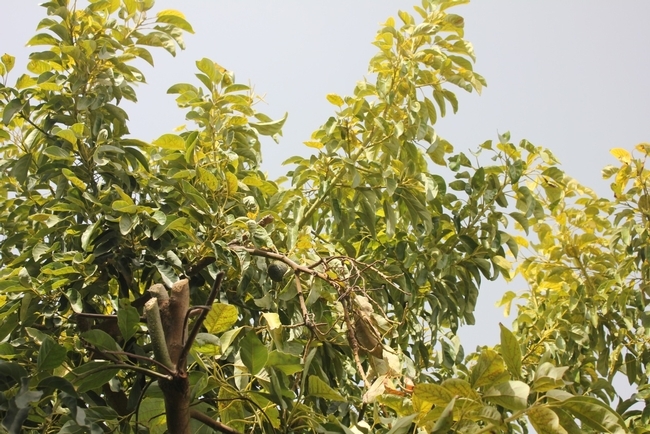 Many commercial avocados are now routinely pruned to keep the trees short, so that harvesting costs and other tree maintenance expenses are reduced. Also more light shines into the trees, so that more fruit is borne on the lower branches. Light or minor pruning can be done any time of year to correct imbalances or limb breakages. However, major or heavy pruning should only be done in the early part of the year from January through April. 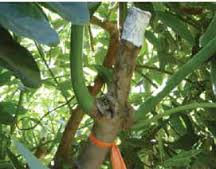 Avocados flower and bear fruit at stem terminals, so if you give the tree and buzz cut (heading cuts), all the flower terminals will be cut off and there will be no flowering the following year. It also leads to an explosion of water sprouts that result from bud break up and down the branch because the terminal bud which control the buds lower down have been removed. Naphthalene acetic acid (TreeHold) painted on the cut end can be used to restrict some of this wild bud break. Whenever possible, thinning cuts should be made, where the branch is removed back to a subtending branch. This results in much less wild growth. Also when there are buds that start growing into water sprouts, they can be nipped back to force lateral growth. These laterals will then slow down the growth of the sprout and the side terminal buds will also be able to grow and transition of flower buds later. Work in Carol Lovatt’s lab at UCR has shown that terminal buds need a certain maturity to flower and the transition from a vegetative bud to a flowering bud occurs sometime in late summer/early fall. If pruning is done in July, there is not enough time for the new buds to mature by August and there will be no flowers from that branch the following spring. New vegetative buds formed on growth from spring will often have enough maturation time to make the transition to flower buds, resulting in flowering the next spring. Again, light pruning can be done at any time of the year, but removing terminals is removing potential fruiting wood. Therefore, if heavy pruning is needed, it is best to remove one branch at a time. To reduce the height of a tree, cut out the tallest branch one year, the next tallest branch the following year, and so on until the tree is down to the height required. The process may take three to four years. By reducing the height over several years, the tree is put under less stress, less disease is likely to occur and fruit production is not drastically reduced. Pruning the sides of the tree should be done in the same way. Prune off a side branch that most impinges on a neighboring tree one year, then the next worst offender in the second year, and over the years continue this process until there is light all around the tree. If pruning creates major open areas in the tree to sun-light where there once was shade, the exposed branches should be painted with white latex paint diluted with water so that it can be sprayed on. It needs to be white enough that it can reflect sunlight and avoid heat damage that can cause sunburn. Sunburn can utterly destroy all the work that has been done. If the trees are really monsters, the only real alternative is to bring the whole tree down. But not stumping, rather scaffolding where much of the structure is maintained. This is where the tree is brought down to as high a height as is convenient and safe. By cutting the tree to a height of 8 feet or so, there is not so much rank regrowth because a greater portion of the tree is retained. Also many times there are leafy branches that remain that will flower and fruit and slow the wild regrowth. Water sprouts that form should be headed back to force lateral growth that encourages stems that will flower, which will also slow the wild regrowth. And one last warning. Do not. Do not. Do not. Got it? Prune sick trees. If the roots are compromised, the regrowth is going to be hard on the roots. Get the trees perked up with one of the phophite products so that they are ready to go through this process. You may have to wait a couple years to start the pruning process until the trees are in shape for the rigors. Image: Don't make cuts like this.